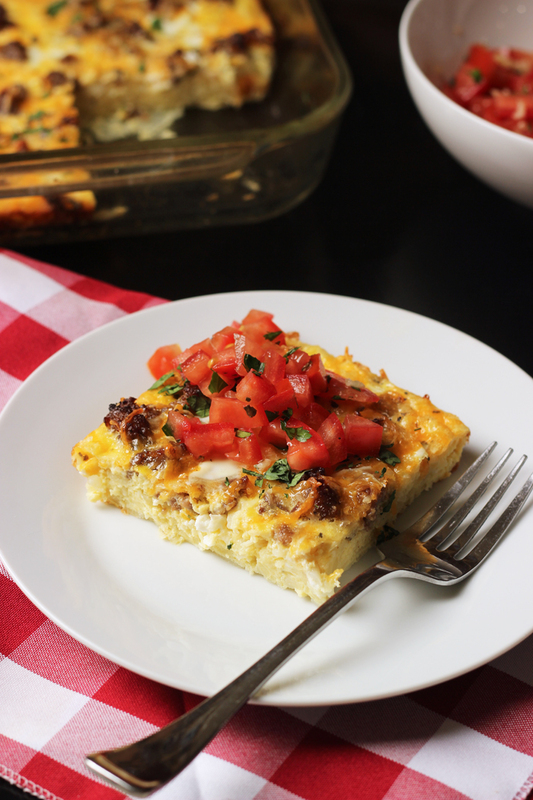 Enjoy a flavorful breakfast or brunch with this Italian Sausage Egg Hash Brown Casserole. It’s very make-ahead, making it a great way to start the day. Breakfast is one of my children’s love languages. Seriously. They come by it honestly. My husband’s favorite meal of the day is breakfast. It’s pretty sweet. One of our first dates was breakfast out. Mornings are when I want to get to work on writing projects. I tend to think more clearly in the morning. I don’t really want to futz with breakfast-making. How does one reconcile a family’s love for breakfast and one’s own agenda to be out of the kitchen? 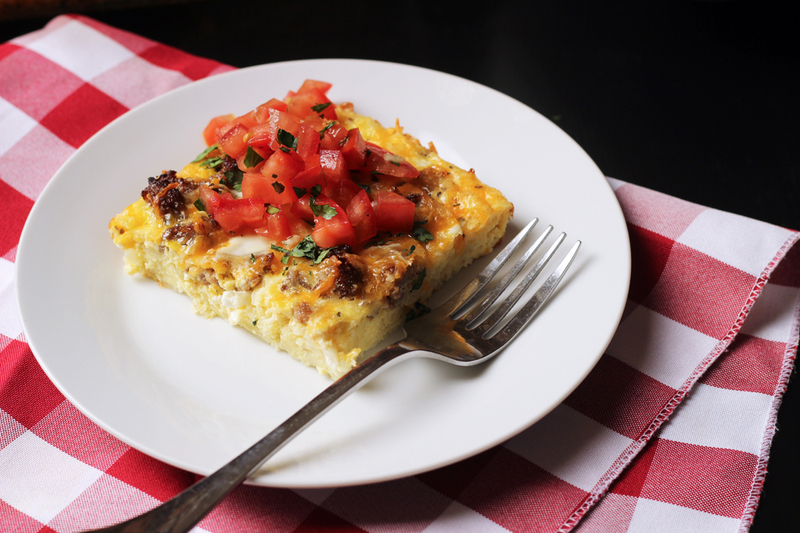 To make this Italian Sausage Egg Hash Brown Casserole. This sausage egg hash brown casserole together super quickly. It can be made in advance as a casserole or as components that assemble in a flash. It serves a crowd without your having to stand at the stove messing. In a word — or two — this is breakfast perfection. 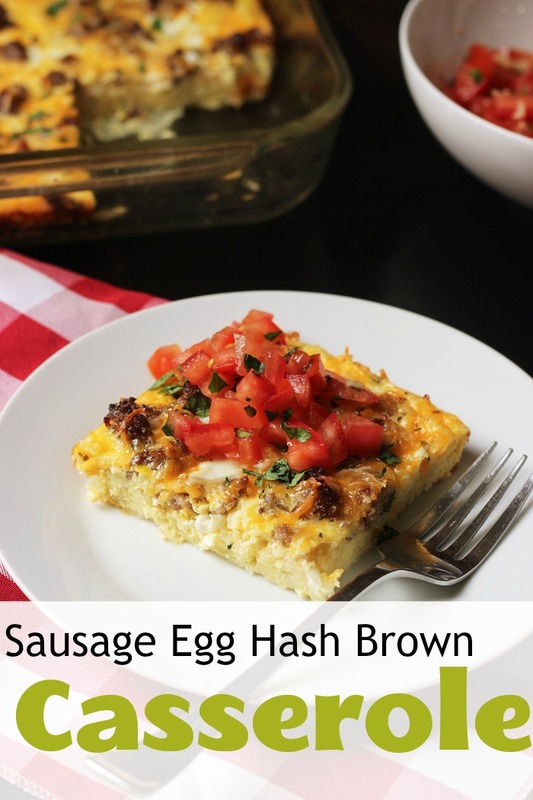 There are lots of ways you can go with a sausage egg hash brown casserole. Add green chiles and cumin and go southwest. Add thyme and tarragon and call it a crustless quiche. Leave out the herbs and you’ve got something like a Spanish tortilla. Use Italian sausage and basil and top it all with tomato bruschetta? You’ve got an Italian breakfast mash-up. And something worth putting aside your morning projects for. Do a price comparison. I know that Costco is the best place to buy ingredients like eggs and sausage when there isn’t a great sale elsewhere. I keep track of prices so that I know who has the best deal where. 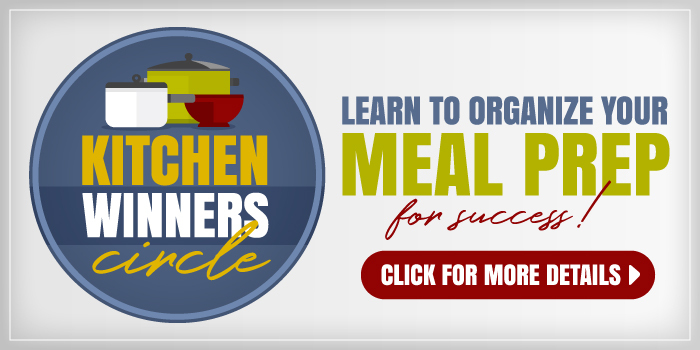 Stock up on ingredients when they are on sale. For instance, when I see a great price on eggs, I buy a lot. This often happens at Ralphs where I’ll find organic eggs marked down for less than $2. I recently found Applegate uncured bacon on manager’s special. I loaded up my freezer with all that was there. It’s a great way to save money on groceries without clipping a single coupon. Use a lower priced alternative. Sausage out of your target price? You can sub a cheaper meat like ground turkey, beef, or pork. The cheese and milk can even be omitted completely and lower the cost of the dish. 9×13-inch pan – I love the ones that come with plastic lids for easy storage and stacking in the freezer. Can You Freeze Egg Casserole? Absolutely! You want to allow the sausage to cool before placing it into your dish. Then once assembled, just cover it well and place in your freezer. You can freeze this casserole for up a to month. Then thaw in the refrigerator before baking. You can also freeze the filling as a kit. Just freeze the meat mixture, cheese, and frozen hash browns in three seperate bags and then bag all three into one larger bag. Make sure to label with baking instructions and freeze! How Long Can You Keep Egg Casserole In The Refrigerator? You want to make sure to refrigerate leftovers within 2 hours. And as long as its covered, the casserole will last 3 to 4 days. You can also freeze leftovers as well for up to 3 months. 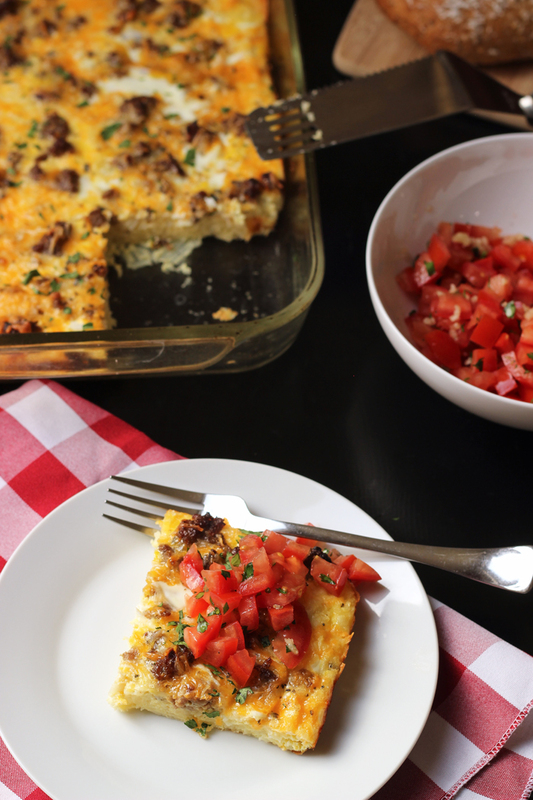 Enjoy a flavorful breakfast or brunch with this Sausage Egg Hash Brown Casserole. It's very make-ahead, making it a great way to start the day. In a large skillet, cook the sausage and onion until the sausage is no longer pink and the onion turns translucent. Meanwhile, layer the potatoes in the bottom of the prepared pan. Drain the meat mixture and spread it over the potatoes. Sprinkle the cheese over the meat. In a large mixing bowl, combine the eggs, milk, basil, red pepper flakes, salt and pepper to taste. Pour the egg mixture over the cheese. Bake for 45 minutes, or until set. Serve hot or at room temperature with the bruschetta on the side. To freeze: Cool the sausage mixture before placing it in the pan. Once the dish is assembled, cover and store in the freezer for up to one month. Thaw completely in the refrigerator before baking. You can also freeze the fillings as a kit. Bag the meat mixture, cheese, and frozen hash browns separately and then collect the three bags in one bigger bag. Label with baking instructions and freeze. This sounds yummy and easy. I would probably substitute regular breakfast sausage, since my husband isn’t that fond of the Italian sausage. I’m assuming it would work, since you suggest subbing ground meat. 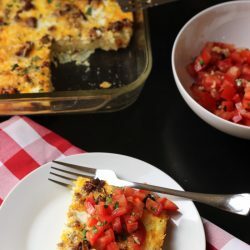 I really like the idea of another breakfast casserole that doesn’t use bread. Thanks for all you do. Yes, your subs will all work really well. I would saute the ham and bacon first. 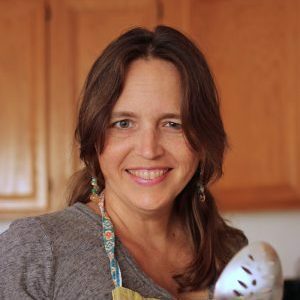 I rarely use bread in egg casseroles, so you should be able to check out the others here for ideas. I made the casserole using breakfast sausage and dehydrated hash browns last Sunday and it was great. We enjoyed it and the leftovers were handy as well. Thanks again for a great recipe. Didn’t see anyplace to rate it but it gets 5 stars from me. So glad you enjoyed it. Thanks for the review! Okay, now I see the rating. I made this with some left over ham from Easter that I had hanging out in the freezer. It was so good! My whole family asked me to make it again, which I will happily do because it was so darn EASY and TASTY!! I assembled it the night before and pulled it out of the fridge an hour before baking. Baked it as instructed – it came out perfectly!! Making it again for Mother’s Day brunch. 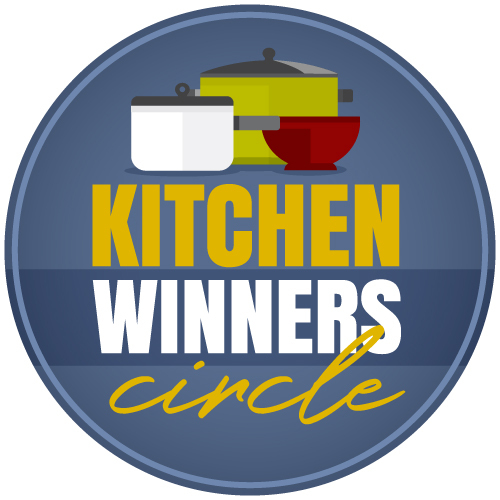 Thanks for the great recipe – it’s a keeper! I made it with ham this weekend too. Love it! Prepping this for an easy and delicious Christmas morning. Thanks.